Be sure to check out my newest book, Washington's Nightmare: A Brief History of American Political Parties , available now at Amazon.com! 1. 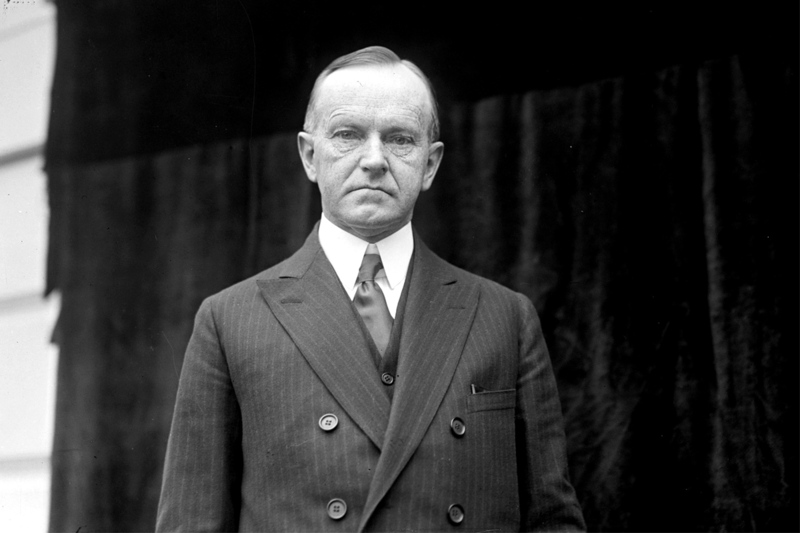 John Calvin Coolidge, Jr., was born in Vermont in 1872, the only U.S. president born on the Fourth of July. His father was a successful farmer and small business owner, and later served in both the Vermont House of Representatives and state Senate. His mother died when he was 12 years old. After attending Amherst College and then studying law, he opened his own law practice in Northampton, Massachusetts in 1898. 2. In 1905, Coolidge married Grace Anna Goodhue. They had first met several years earlier after Grace caught site of Calvin shaving in front of a window in nothing but long underwear and a hat. The hat, apparently, was worn to keep hair out of his face while he shaved. Together they had two sons. At the age of 16, and while his father was president, the younger son, Calvin, developed a blister on his foot after playing tennis and died a week later from sepsis. The elder son, John, became a successful businessman and died in 2000. 3. Coolidge enter local politics in the early 1900's, holding several locally-elected offices. It was during this time that he suffered the only electoral defeat of his career - a seat on the Northampton school board. In 1906, he won a seat in the Massachusetts House of Representatives as a Republican, later served as the mayor of Northampton, then served in the Massachusetts Senate, where he eventually became Senate president. 4. Following his time in the Massachusetts Senate, Coolidge served several terms as lieutenant governor to Samuel McCall before being elected governor himself in 1918. Coolidge was a moderate Republican: fiscally conservative, but supporting women's suffrage and opposing prohibition. He gained national prominence among Republicans in 1919 when he helped put down a strike, with subsequent riots, in Boston involving police officers who were attempting to unionize. 5. At the 1920 Republican National Convention, Coolidge was discussed as a possible presidential candidate, but ended up coming in 6th on the balloting. However, his name was brought up again during the balloting for vice-president, and he unexpectedly won the nomination to be Warren G. Harding's running mate. 6. It was during his time as vice-president that Coolidge earned the nickname "Silent Cal." Though he was known for being an eloquent public speaker, in private he was withdrawn and quiet, typically deferring to his wife, who was equally known for her outgoing personality. His tendency to withdraw from social situations intensified after the death of his son in 1924. 7. President Harding died suddenly in August of 1923, while Coolidge happened to be visiting his father in Vermont. By that time, his father was a notary public, so in the presence of gathered reporters around 2:30 in the morning, he administered the oath of office to his son, after which the unexcitable Coolidge went back to bed. There was some concern over whether a state notary public had the authority to administer the oath, so it was re-administered after Coolidge returned to Washington. 8. After finishing Harding's term, Coolidge was easily nominated for president in 1924, and despite a third-party candidate who effectively split the Republican Party, Coolidge still won in a landslide, thanks largely to a booming, post-war economy. His inaugural speech that year was the first in history to be broadcast on the radio. Though he had been associated with the Progressive faction of the Republican Party early in his career, as president he moved toward the right, embracing low taxes, deregulation of industry, decreased government spending, and famously stating that "the chief business of the American people is business." His Secretary of Commerce was Herbert Hoover. 9. Coolidge opted not to run for re-election in 1928, noting that it would mean he would be president for ten years, and ten years was simply too much. He had very famously butted heads with his own vice-president, Charles Dawes, on numerous occasions, and when the 1928 Republican Nation Convention considered putting Dawes on the ticket with Herbert Hoover, Coolidge intervened and stated that he would take such a move as a personal insult. The convention honored his wishes and chose Charles Curtis instead. Dawes would later win a Nobel Peace Prize for his efforts to rebuild Europe following World War I. 10. In his retirement, Coolidge wrote his memoirs and also wrote a syndicated newspaper column in the early 1930's. Like his old running mate before him, Warren G. Harding, Coolidge died unexpectedly of a heart attack in January of 1933. He was buried in a simple plot in the town cemetery of Plymouth Notch, Vermont, where he was born. the fact about his son dying because of the blister was a really good fact! Do you know his mother & father's name? John Calvin Coolidge and Victoria Josephine Moor. Thanks! Really helping on project! No worries. Glad the information helped! I never really knew that much about him, but we're visiting Vermont and got to see his birth place and resting place. Very cool. Thanks for the great info.